It's enough to make you believe in Creationism. Once, there was nothing at the bottom of Philadelphia's Broad Street but an ancient, crumbling football stadium and the South City Drive-in movie theatre, an entertainment concept whose time had come and gone. Then, Ed Snider, the vice president of operations of the Philadelphia Eagles, in negotiations with the Philadelphia Phillies to build a joint football-baseball stadium, which became Veterans Stadium, learned the NHL wanted to expand. The hitch? A bidding city needed an arena. So, Snider talked with Ike Richman, the owner of the Philadelphia 76ers, and learned he'd be interested in a joint hockey-basketball arena. 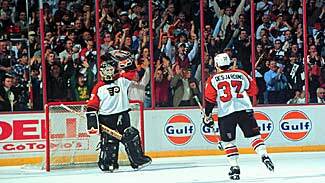 That led to Snider bidding for and winning the expansion Philadelphia Flyers franchise. So, Snider built the Spectrum in a little over six days. On the seventh day, he rested and watched his first-year team get eliminated in the first round of the Stanley Cup Playoffs. So, on the eighth day, Snider said, "Let there be bigger, tougher players." The formula worked. Within seven years of their founding, the Flyers won the Stanley Cup. Then, they won the next Stanley Cup. Since then, they have been one of the most successful franchises in the NHL. Now, the south end of the Broad Street hosts the Wachovia Center, the home to the Flyers and 76ers, Citizens Bank Park where the Phillies play, and Lincoln Financial Field, the home of the Eagles. The Spectrum is due to be torn down in about a year to make way for an entertainment district that will house a hotel, restaurants, bars and shops. The Flyers returned to the Spectrum Saturday to host the Carolina Hurricanes in the last game between two NHL teams, a preseason affair that predictably featured a few tussles. Outside the Spectrum, the Philadelphia sports complex spreads over hundreds of acres, space sufficient for Saturday's simultaneous hockey game, Temple University football game and the Phillies' bid to clinch the National League East title. Snider waxed nostalgic before the game. And, OK, it took him more than six days to construct the Spectrum but the building did go up in record time. "People always underestimated the number of hockey fans in this city. This city is a hockey town and we have hundreds and hundreds of thousands of fans. It's just exciting when I walk into this building and everybody is telling me about their favorite memory and it just makes me realize that we have a really great fan base here. They love the Flyers and we love them and we are very, very fortunate to have this fan base." Snider entered the Spectrum with a group of friends and family members shortly before noon and was greeted by hundreds of fans who shouted their thanks and encouragement. "This brings back so many fabulous memories," Snider said. "I really didn't know how I'd feel until I saw so many fans outside, celebrating, all our fans are excited and what great fans we have. "When I walked into the building today, and over the years, fans told me about their Spectrum memories, the first game they ever saw, specific occasions and specific games. So many of them that you can't enumerate them all but I think everybody knows that our No. 1 exciting event was when we won the (Stanley) Cup, here in the afternoon in 1974 and the parade the next day which had 2 million people. People said we had only 17,000 fans but the whole city was celebrating. The next year we won it again in Buffalo and came back to another 2 million-plus people parade that I've never seen the like of, anywhere, in any city. Everybody had a Flyers' T-shirt on, both years." The Flyers' invited all their former captains to Saturday's pregame ceremonies and most of them were here. Snider was asked about the emphasis on the "Flyers family" concept he has nurtured since the beginning. Coach Fred Shero's pregame speech before the final game of the 1974 Stanley Cup included the line, "Win together today and you will walk together forever." Shero passed away many years ago, but the Flyers have kept that promise to the team. "We wanted the Flyers' organization, the players and the fans to be one big family," Snider said. "That was a goal of mine. We have a wonderful alumni, maybe the best in all of hockey. They always come back. We have all kinds of functions. We look after our own. "In our organization, Bob Clarke, as General Manager, was an ex-player. Paul Holmgren, as GM, is an ex-player. I'm so thrilled that Keith Allen, who engineered both Cups, is here today. We keep the family atmosphere and it's something that's important to me and I'm thrilled with what we've accomplished." Snider said he probably won't watch the Spectrum demolished, but he has come to terms with the idea that what is valuable about the Spectrum is the memories and not the brick and steel.